1924. "Bureau of Standards. New and improved measuring board for U.S. Children's Bureau." Harris & Ewing Collection glass negative. View full size. Submitted by Anonymous Tipster on Tue, 02/10/2009 - 5:10pm. My daughter (now 3) was put on the same type of measuring device, only difference is it was plastic. I guess the good ideas stick around for the long haul. Submitted by Mikey D. on Wed, 01/28/2009 - 6:22am. "Measure twice and cut once." Submitted by Anonymous Tipster on Mon, 01/26/2009 - 10:57pm. Take it from a retired Public Health Nurse. This is the best way to measure babies. Did it many times at our Well Baby Clinics. With a writhing baby, have mom hold the feet flat against the foot board, and keep the body straight as possible. Slide the head board to the top of the infant's head, and you have the measurement. We did keep our babies dressed however. More difficult was trying to keep them still while on the baby scale to weigh them. Submitted by Mr Mel on Mon, 01/26/2009 - 7:24pm. I still think the best method is to stand them up against a wall and draw a line right above their heads. It's difficult with (but not impossible) with infants. The other problem is when the wall has to be painted. Submitted by Anonymous Tipster on Mon, 01/26/2009 - 2:34pm. This is how the pediatrician measured my daughter when she was an infant (she's now 4). Works as well or better than other methods I've seen. Submitted by T.U.M. on Mon, 01/26/2009 - 2:20pm. I was thinking it kind of looks like the boards the Chinookans used to shape their babies' noggins. Submitted by Haley on Mon, 01/26/2009 - 1:19pm. It's no surprise that this device never became popular! Whoever thought up the idea evidently didn't have a lot of contact with babies! Squirmy little things they are! Submitted by Anonymous Tipster on Mon, 01/26/2009 - 12:37pm. So that's how they make Baby Oil. With a baby press! Submitted by Anonymous Tipster on Mon, 01/26/2009 - 10:46am. That's an exceedingly calm baby, under the circumstances. Most people would not be nearly so serene when being measured like a foot for a shoe. Submitted by stanton_square on Mon, 01/26/2009 - 10:12am. The versatile bureau of standards has now turned its attention to babies and has designed a new and improved measuring board for the U.S. children's bureau. 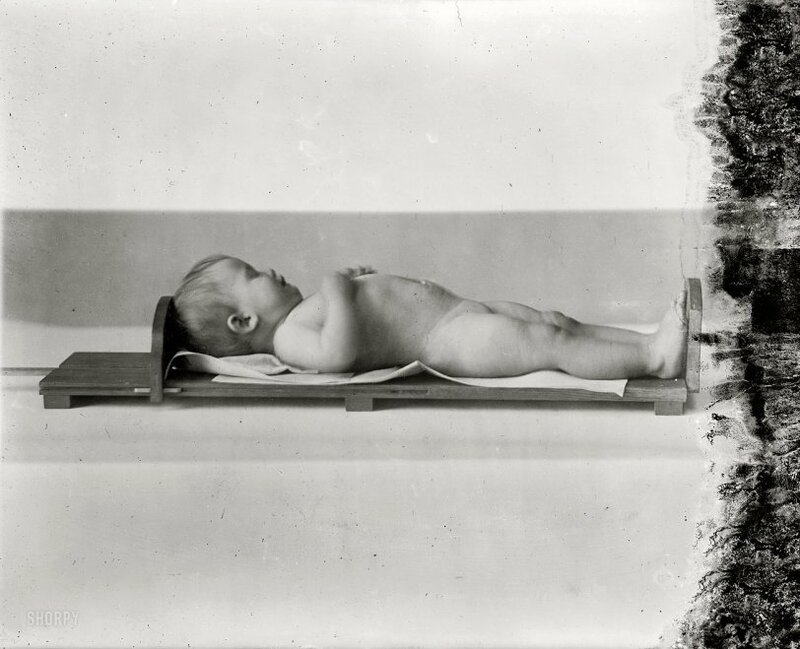 It is constructed so that the baby may be measured with a minimum of handling and discomfort.